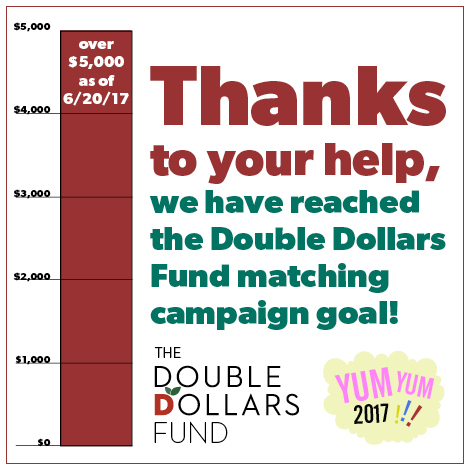 We have reached the Double Dollars Fund matching campaign goal! Madison Area Chef’s Network and their Yum Yum Fest will match the $5,000 raised, adding a total of $10,000 to The Double Dollars Fund. Thank you to MACN, to Community Action Coalition For South Central Wisconsin, and all customers who helped! This year your Co-op is one of the first retailers in the nation to set up consistent, non-grant funding for the cause of affordable fresh foods through a program called Double Dollars. Double Dollars is not new to us. Some local farmers markets have been distributing them and we started it at our stores last October. What’s new is that, as of this April, this program will no longer rely on grants to stay alive; it will be sustainably supported by your Co-op and our shoppers to help lower income people have access to healthy fresh foods. For anyone not familiar, Double Dollars is a community partnership program between the City of Madison, Dane County, the Community Action Coalition, six local farmers markets, and Willy Street Co-op that offers FoodShare recipients greater access to fresh, healthy food. News of the plan to keep Double Dollars self-funded and functioning year-round reached Madison Area Chef’s Network (MACN), host of the Yum Yum Fest. The network stepped in to help create awareness and bring in support. From May 30 until June 20, MACN is offering to match any contribution made at the Co-op up to $5,000 toward the Double Dollars program; the donation will be made based on sales of Yum Yum Fest tickets, and may even go higher. Co-op shoppers who are able to extend a helping hand to neighbors in need can now do so even more effectively through this match effort. Every contribution will be matched, whether people donate at the register or use their own bags to shop. As a result, the shoppers using their QUEST card will be able to receive vouchers good for extra food purchases at select local farmers markets from June through December and at Willy Street Co-op this fall through next spring. Previously, the majority of the funding for Double Dollars has been supported by grants and by private donations. Now, with the help of the Double Dollars Fund year-round and Madison Area Chef’s Network’s Yum Yum Fest, people can use these cards and watch their support go twice as far to help people on FoodShare benefits purchase more fresh foods at the Co-op and at the six participating farmers markets around Madison. About Community Action Coalition For South Central Wisconsin, Inc.
(CAC)Community Action Coalition For South Central Wisconsin, Inc. is a private non-profit Community Action Agency whose mission is to develop economic and social capacities of individuals, families and communities to reduce poverty in Dane, Jefferson and Waukesha Counties. For more information visit our website at www.cacscw.org. MACN chefs embrace seasonality and preserve diversity while collaborating with the broader food community and supporting the local community and economy. The network consists of over 50 individual chefs. MACN is led by three main principles: 1. Link local food producers and farmers with local chefs and the broader food community to increase the use and exposure of locally grown foods. 2. Build a network of dedicated chefs collectively sharing best practices and fostering commitment to bettering current endeavors and future longevity. 3. Advocate and support causes related to MACN's mission. On August 6th at Breese Stevens Field, the Madison Area Chef’s Network will be hosting the most delicious day of summer - Yum Yum Fest (www.yumyumfest.org). As part of this years festival, they have pledged a donation of $5,000 to the Community Action Coalition For South Central Wisconsin Inc. (CAC).